How A Detroit Flop Became South Africa's Superstar In Searching for Sugar Man, director Malik Bendjelloul tells the story of the search for Rodriguez, an American musician who never made a splash in his home country, but who — unbeknownst to him — became the voice of the liberal, white, anti-apartheid movement in South Africa. 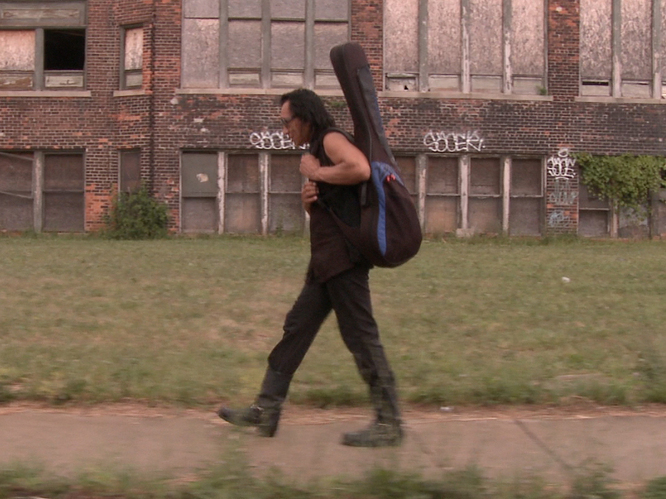 Rodriguez carries his guitar through Detroit, Mich., his hometown. Searching for Sugar Man tells the story of the search for musician Sixto Rodriguez. The Detroit-based folk singer released a couple of albums in the early seventies, but those records flopped in the United States. Unbeknownst to Rodriquez, his albums made their way to South Africa and electrified liberal young Afrikaners who came to consider him a superstar. "He was like the voice of freedom in a time in South Africa where ... people didn't have freedom. It was this censored, horrible apartheid regime," director Malik Bendjelloul tells NPR's Neal Conan. "He actually ... without even knowing what he was aiming, changed a society." Bendjelloul explains how his music made its way to South Africa and the search for Rodriguez decades later.